​In 1853 Randolph County, Virginia, was a tract of country called Canaan, as it is still called to this day. Canaan, containing from seven to nine hundred square miles, was then entirely uninhabited, and so savage and inaccessible that it has rarely been penetrated even by the most adventurous. 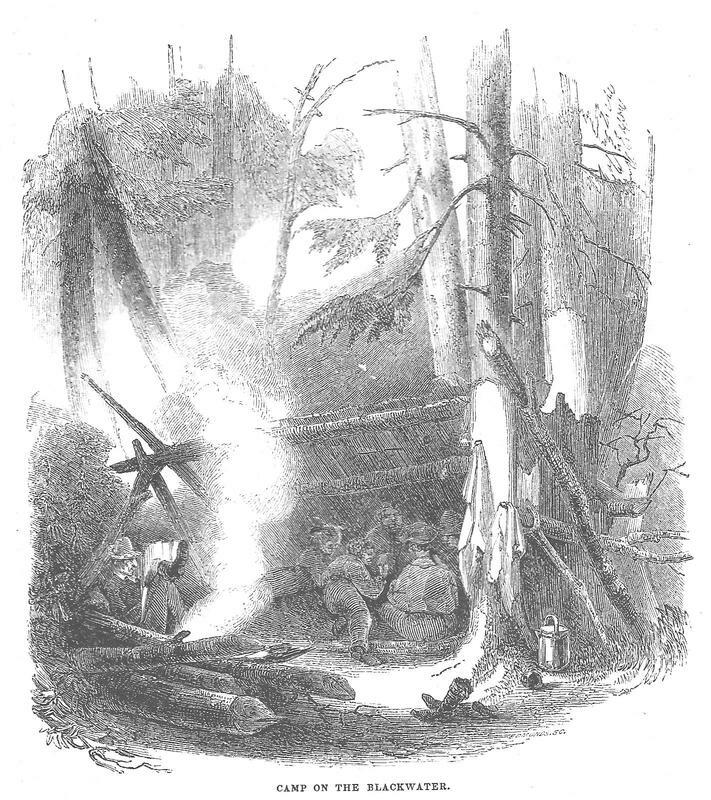 ​So begins the 1853 narrative, written and illustrated by Porte Crayon [i], of an expedition by six intrepid young gentlemen of the Shenandoah Valley, then of Virginia, into the savage wilderness of the Canaan. We have fixed upon the 1st of June to start for Canaan Country. Our party will consist of Dindon, Jones, Smith, your old friend Penn, and myself. Can you join us? If so, give us immediate notice, and set about making your preparations without delay. I would recommend to you to procure the following equipments: a water-proof knapsack, fishing tackle, and a gun; a belt with pistols--a revolver would be preferable, in case of a conflict with a panther; a hunting- knife for general purposes--a good ten-inch blade, sharp and reliable. It will be useful for cleaning fish, dressing game,and may serve you a turn when a bear gets you down in a laurel brake. Store your knapsack with an extra pair of shoes, a change of raiment, such as will resist water and dirt to the last extremity,a pair of leggings to guard against rattlesnakes, and the following eatables: one dozen biscuit, one pound of ham, one pound of ground coffee, salt, peppers and condiments. This will be the private store of each person, the public supplies will e carried out on horses. "The place of rendezvous is the Berkeley Springs, the day the 31st of May.
" Mr. X M C will certainly come." Porte Crayon, the artist and narrator of the tale. Dindon,athletic, sportsman, never wearied in a debate. Penn, an author of some distinction, his language poured forth in irresistible torrent. Jones, inclined to be stout, not to say fat, fond of sports and personal comforts. Smith, of imposing presence, of few words, but zealous promoter of the expedition. Guides were engaged. Thornhill, an intelligent, energetic, good-tempered fellow agreed to undertake the job, along with Conway, a woodsman of unperturbed gravity. Thornhill's dwelling, Porte Crayon declared, looked like the connecting link between a hut and a wood-pile. 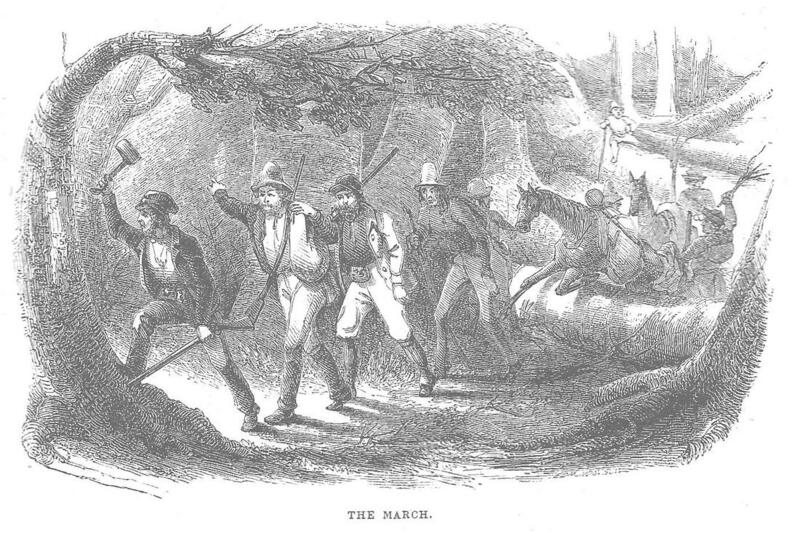 The march into the Canaan thus begun, Thornhill, with his tomahawk, led the van. Dindon, Crayon, and Penn followed; then came the pack horses Lame Kit, led by Conway; and Old Sorry, conducted by Powell, a hunter engaged to to bring the horses out. Smith and X M C formed the rear guard and far behind lagged Mr. Jones. Toward evening the rain fell in torrents. A more cheerless prospect for a night could scarcely be imagined. Conway's woodcraft however, triumphed. With knife and hatchet he gathered forks, props and cross-poles he he speedily covered with bark a complete shelter and soon raised a roaring cheerful fire. 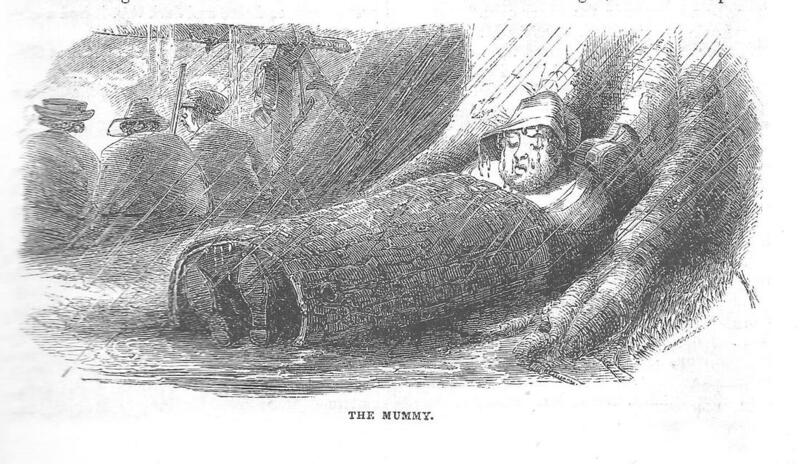 Mr. Jones rolled himself in a blanket of bark, procured by Mr. Conway. Penn and Smith could not resist the desire of trying their fine rods. Having fitted them up, they made a simultaneous throw. Smith's foot slipped , and he came down upon the point of his rod, splintering it to the last joint. Penn made a magnificent fling, but having forgotten to attach his line to the reel, three of the joints went over the falls, carrying with the the line and that incredible specimen of entomology, the fly. 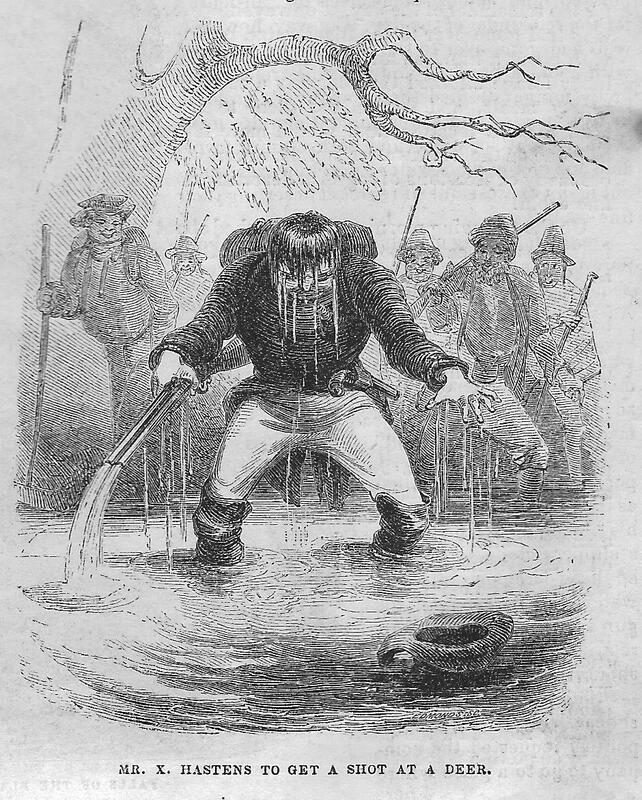 Intent upon fishing , the party marched about four miles and came upon Blackwater Creek. As they followed down the bed of the stream, a deer was see to cross a short distance from them, which so excited Mr. X that he made a rush to get ahead of he main body, and if possible to get a shot. Just a he was about attaining his objective he set foot upon a slippery stone, and pitched head-foremost into the water. As he was hailed with shouts of encouragement.--"there goes the deer!--shoot! bang away!" Mr. X politely requested the company to go to a place where cold water was more of a rarity; and quietly took his position in the rear of the column. Mr. X M C, who had not yet fleshed his maiden hook in the gills of a trout, went out with Conway to try his luck. 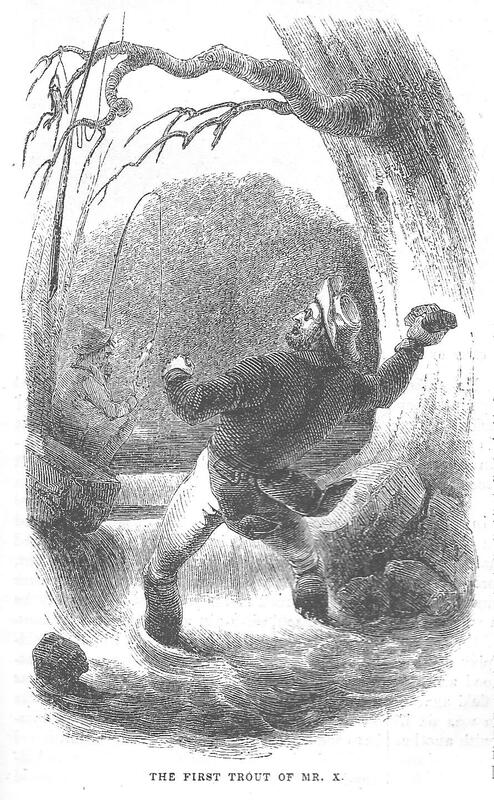 After many unsuccessful attempts, he at length hooked a fellow, and drew him out of the water with such a jerk (X is possessed of great physical vigor), that rod, line and fish were lodged in the overhanging branches of a tree. Here was a spite--the stream was wriggling with trout, and X had just acquired the knack of hooking them; but his implements and, worse than all, the first trophy of his skill, were hanging on the envious boughs. Now, if X M C had any one trait that predominated over all others it was determination. Missiles were plenty, and he straightaway opened upon the devoted fish a mingled shower of stones, sticks,and anathemas. At the end of an hour he succeeded in bringing him down, well dried and slightly tainted. "Well!" quoth Conway, who from a short distance had been the philosophical eye-witness of he proceeding, and who during the time had bagged some sixty of the finest trout--"Well; I've seed fish catched in a great many different ways, but I never seed'em chunked out of trees afore." elevation of ideas, a largeness of speech, an ill-concealed disdain of the petty affairs of life, such as law, medicine, or agriculture; and for a long time, whenever they were invited out, even the heavy-handed and profuse housekeepers of their neighborhood seemed to have suddenly become close and thrifty, or to have made some unaccountable mistake in their calculations." earned experience, and the hope of being heroes and story-tellers for the rest of their days. Alas! they happened in an unlucky time. life, or had ever seen any thing worth talking about." 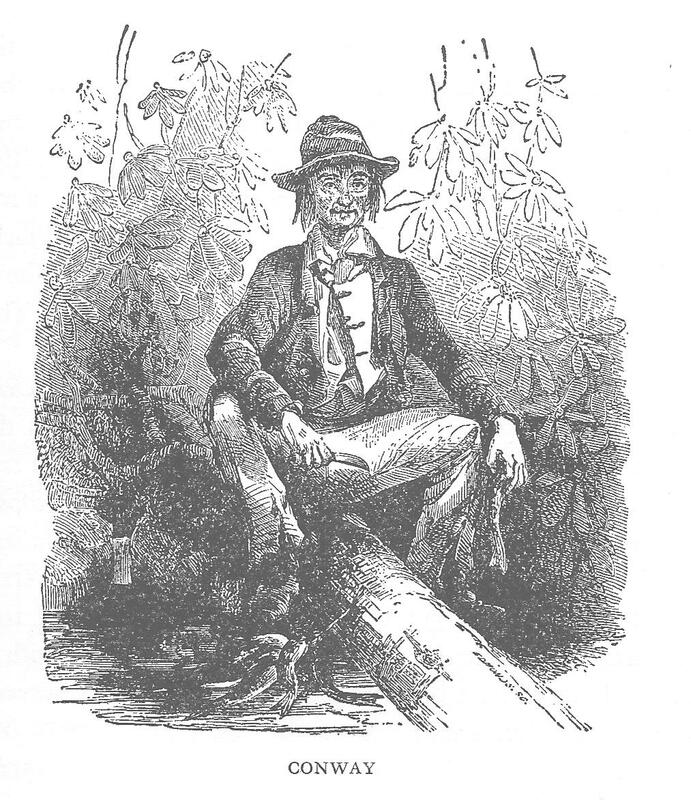 [i] Strother, David Hunter, 1853,The Virginian Canaan, Harper's New Monthly Magazine, vol. 8, pp. 18-36.